[AUTO](VC):[Counter Blast (1)] When your G unit Stride, you may pay the cost. 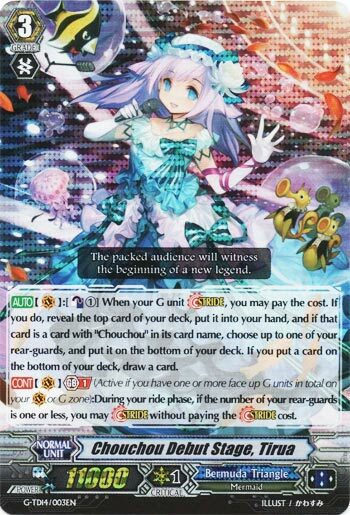 If you do, reveal the top card of your deck, put it into your hand, and if that card is a card with “Chouchou” in its card name, choose up to one of your rear-guards, and put it on the bottom of your deck. If you put a card on the bottom of your deck, draw a card. What’s up, Rogue Squad?! For our Throwback Thursday, we get to look at one of the only Grade 3’s to have an on-Stride skill and doesn’t have another Grade 3 version of herself (ie Lauris, Nightrose, Chronojet, etc. ), and that’s Tirua. First off, her free-stride skill is probably one of the best free-stride skills in the game, especially if you’re going against decks that like minimizing the amount of rear-guards you have, and seeing how Chouchou in general are a pretty aggressive deck that send themselves away after battle, it’s nice not having to discard potential attack pieces to do your multiattacks with. The only real drawback with Tirua is that her on-stride skill is kinda reliant on having a rear-guard out before you stride to get the full effect, but seeing how you’re getting a free card to your hand anyway through the first half of the effect (which is a net +1 if you used the free-stride skill), it’s still an overall solid boss unit for the Chouchous. Next time: SONO CHI NO SADAME…CHOOOOOOOOOOOOOOOOOUCHOU!!! Previous articleBatman Fluxx Review – A Collection Worthy Card Game?